If there’s one thing that is consistent throughout most industrial environments, it’s the presence of noise. Depending on the industry, it can range from a low hum to literally having a jet engine ignite (140 dB!). If workers are operating in this environment for a prolonged period of time, these noises can have a profound effect on their mental and physical health. For example, in the mining industry, workers face a number of hazards from rock crushers, drills, and conveyors. All of these pieces of equipment add more and more noise to their environment, not to mention the respiratory hazards created due to increased air particles. These workers need protection. Industrial control rooms are fully designed to address these problems. 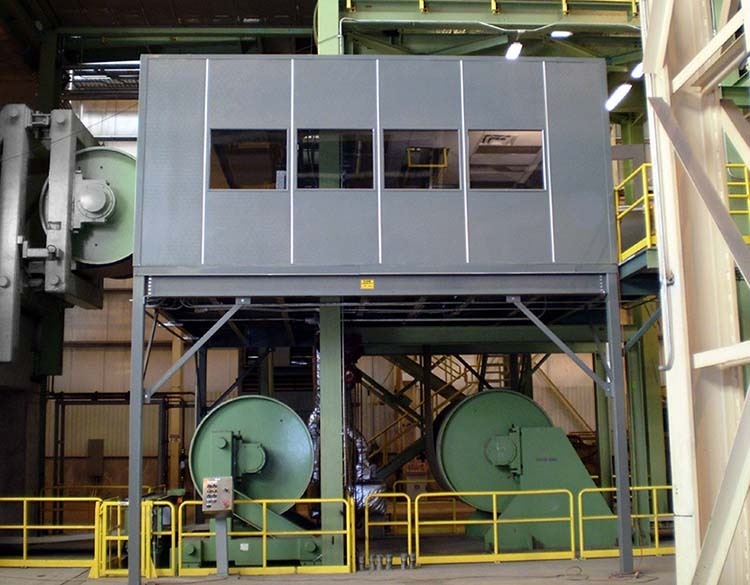 In a mining setting, a prefab control room would be manufactured to reduce noise transmitted through the walls and would integrate air filters into the HVAC. But why is it important to provide this type of environment? Working in a controlled, sound reduced environment reduces the overall stress levels of the workers inside of it. To understand how this works, you first need to learn about brain fatigue or brain fog. Brain fatigue is a state of brain confusion that can be either mild or quite severe. Employees with brain fatigue can experience an inability to focus, and a dulling of your mental awareness. For some people, this can lead to minor workplace errors like typos on reports or just sending an email to a wrong person, but for employees in an industrial environment, these errors may lead to much more severe consequences. A lack of concentration can lead to damaged products, or worse, a workplace injury. One mishap, may it be a forklift accident, dropping materials on your foot, or the slip of a buzzsaw, could potentially be catastrophic for your business. Keeping these types of accidents to an utter minimum is an absolute must for all manufacturing businesses, and reducing brain fatigue and stress is a great place to start. Constant, loud noises cause stress. Panel Built control rooms can be specifically designed to reduce the overall noise level inside of the room so that operators inside can work in a controlled, relaxed environment. Besides the noise of an operation, working in certain industries can simply put workers in tough conditions. High or low temperatures, humidity, air quality, chemical exposure: all are hazards that can be seen in thousands of facilities all over the world. And in most cases, the will be in an environment that has these hazards. These control rooms can be equipped with special HVAC systems. This can include features such as chemical filters, gas alarms, and ballistic/blast proofing. In the case of blast proofing, the building itself will need to be reinforced with blast-resistant materials, a requirement that not all manufacturers can meet. 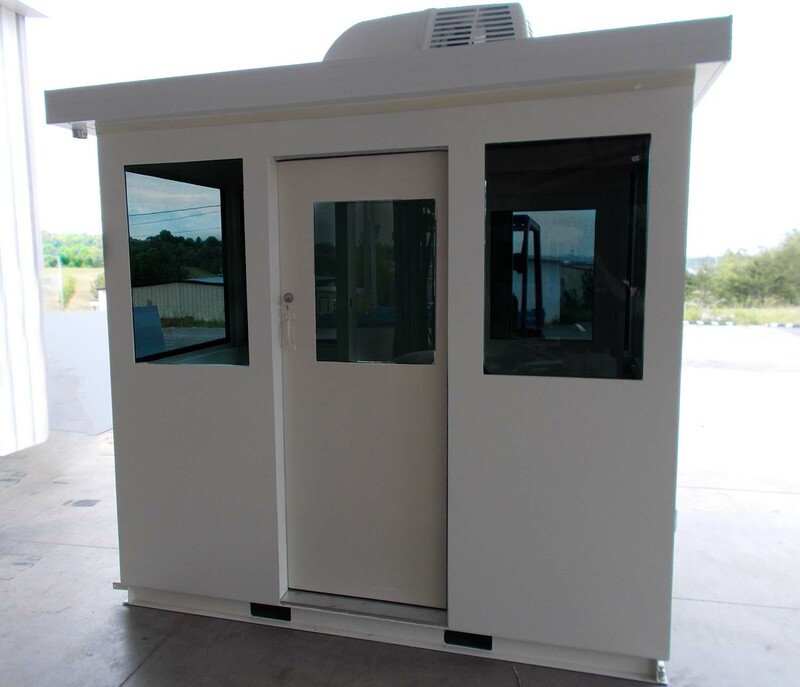 In the case of ballistic rated control booths, Panel Built has a long line of experience with our ballistic line of guard houses and exterior buildings. These highly durable buildings make use of our welded steel division that manufactures bulletproof buildings for the United States government. However, these buildings can also be of use in environments at risk of explosions. Mining operations, oil and gas facilities, and military facilities all can be at risk to explosive threats, and our ballistic rated control rooms are designed to fit this exact purpose. These measures will help ensure the safety of the employees and equipment inside the structure. Perhaps the biggest benefit of using Panel Built for your control room needs is our ability to adapt to your needs. Panel Built control booths can be manufactured to your specific layout, specification, and needs. In the past, Panel Built has designed control rooms for both interior and exterior applications. Buildings can be manufactured to meet snow load requirements in Canada to 180mph wind loads in Florida. In some cases, the control room will need to be installed into a hard to reach or underground location. In this case, the building can be delivered to the facility un-assembled, using our panelized wall system. The un-assembled, “Knock Down” building, will be much easier to maneuver in this scenario and allow for modular control rooms to be installed in areas that would be otherwise impossible to situated into. 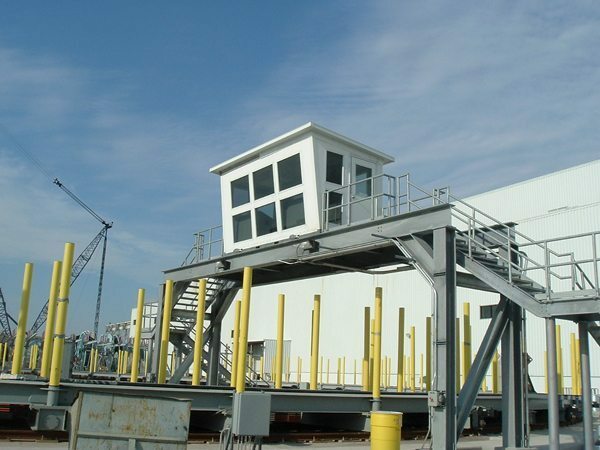 Reversely, when pre-assembled, the control buildings can be lifted or transported to high elevations and anchored into place. 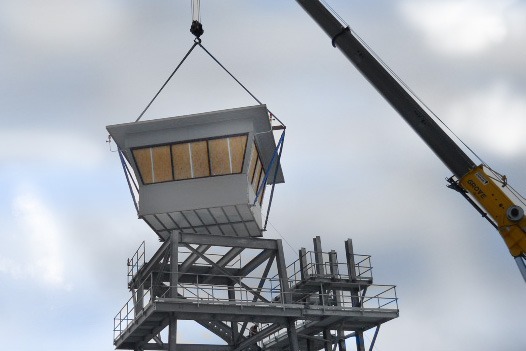 For instance, if the control room will need to be placed on a high tower, the building can be crane lifted, using hooks that attached to the building’s roof. From there, the building will be set into place, anchored to the tower, and hooked up for electricity. Then the process is done. With most of the building fabricated off-site, the install of the control room takes a fraction of the time and is an overall safer method of construction (especially in the aforementioned hazardous environments). Overall, Panel Built’s control rooms offer a fully secure and comfortable environment for its users. With our variety of wall systems and HVAC options, climate control in our buildings is a breeze whether the building is interior or exterior. Sound dampening options can be used to make the room as calm and comfortable as possible. Whether the building will be controlling the flow of traffic in and out of a facility or controlling the flow of materials through a facility, the operator(s) are certain to be in the most pleasant environment possible. So, if you have any questions about our modular control buildings, just give us a call at 800-636-3873 or send us an email at info@panelbuilt.com. With over 20 years in the modular construction industry, we have the know-how and experience to deliver the building that is perfect for you. Request control room quote here or talk to us in our LiveChat at the bottom of the page.